There are three different kinds of bankruptcy that an individual can file: Chapter 7, Chapter 11 and Chapter 13. Each is designed to provide relief to a distressed debtor, but each does so in a different way with different goals in mind. A Chapter 7 case is designed to allow the debtor (the person who files the bankruptcy case) to discharge (eliminate) debt in exchange for property that the debtor does not need for a fresh start. Sometimes, the debtor has debts that cannot be eliminated as easily, or they owe back payments on a house or car loan. In a Chapter 13 case, instead of surrendering property that will be sold to pay debts, the debtor makes a payment each month for three to five years to a trustee who distributes it to the debtor's creditors. This gives the debtor a mechanism to get caught up on past due house or car payments or to pay out nondischargeable debt over the life of the plan. To support a Chapter 13 plan, you must have a regular and reliable source of income. This income usually comes from wages earned from employment, but it can also come from other sources like a business, alimony, pension, Social Security or disability payments, even unemployment compensation. A plan must also account for any regular bonuses or other increases in pay due to raises, or for reductions in pay, like those that come from seasonal work. In fact, it may be possible to construct a plan in which the payment amount will change every year, every six months or even every month if income is expected to increase or decrease. For this reason, the debtor has to provide the court with proof of income for the six full months before the case is filed. 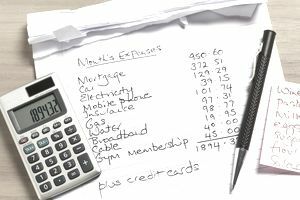 You are also required to provide the court with a list of your actual monthly expenses. For some expenses, we use your actual expenses. But for others, Congress has decided that we can only use a certain type or certain amount of expense. For instance, we take into account the actual amount you pay for your mortgage or rent. But, your utilities are lumped together into a flat amount that is dictated by charts published by the Internal Revenue Service. When we subtract your reasonable and necessary expenses from your income, we are left with your "disposable income". For many people, the disposable income becomes their monthly payment. For others with particular types of debt or with nonexempt assets, the payment calculation is a little more involved. Each creditor has to file a form with the court called a Proof of Claim. In it, the creditor will tell the court how much the creditor thinks you owe. The creditor will attach copies of documents to show that you are liable on the debt and account statements to show how much you owe. Certain creditors have what are called Priority Debts. Those debts have to be paid in full by a Chapter 13 plan. They include certain income taxes, past due alimony and child support, wages you owe someone who worked for you and some other types of debt. If you are behind in your house or car payments (also called Secured Debts), and you want to keep the house or car, your Chapter 13 payment has to be enough to pay those past due amounts during your plan. If you have more assets than you would be allowed to keep in a Chapter 7 case, you have to account for those nonexempt assets in your Chapter 13 plan. In a Chapter 13 case, your unsecured creditors, like debts like credit cards, medical bills and personal loans, must be paid at least as much as they would receive if you had filed a Chapter 7 case. Therefore, the amount paid to your unsecured creditors must equal at least the value of your nonexempt assets. This is called the Best Interest of Creditors Test. After your priority debts and your secured debts are paid, anything left over is divided among the claims filed for unsecured debts. Here is the beauty of Chapter 13: When you come to the end of your plan, whether it is 36 or 60 months if you have not paid enough through your plan to pay those unsecured debts 100%, it doesn’t matter. The rest will be forgiven. We say that the debts are discharged. Calculating a Chapter 13 plan payment is not for the faint of heart. Although it can be done by hand, most experienced consumer bankruptcy attorneys rely on computer software. This is one reason why filing a Chapter 13 case pro se (without an attorney) can be very difficult.